Infrared quantum cutting involving Yb3+ 950–1,000 nm (2 F5/2 → 2 F7/2) and Ho3+ 1,007 nm (5S2,5F4 → 5I6) as well as 1,180 nm (5I6 → 5I8) emissions is achieved in BaGdF5: Ho3+, Yb3+ nanoparticles which are synthesized by a facile hydrothermal route. 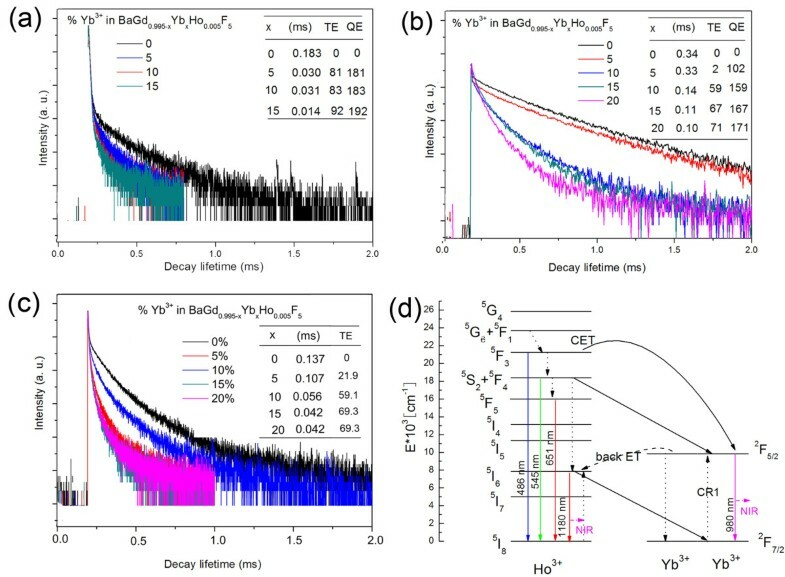 The mechanisms through first- and second-order energy transfers were analyzed by the dependence of Yb3+ doping concentration on the visible and infrared emissions, decay lifetime curves of the 5 F5 → 5I8, 5S2/5F4 → 5I8, and 5 F3 → 5I8 of Ho3+, in which a back energy transfer from Yb3+ to Ho3+ is first proposed to interpret the spectral characteristics. A modified calculation equation for quantum efficiency of Yb3+-Ho3+ couple by exciting at 450 nm was presented according to the quantum cutting mechanism. Overall, the excellent luminescence properties of BaGdF5: Ho3+, Yb3+ near-infrared quantum cutting nanoparticles could explore an interesting approach to maximize the performance of solar cells. Lanthanide (Ln) ions could exhibit both efficient upconversion (UC) and downconversion (DC) emission properties , where the UC process converts low-energy light, usually near infrared (NIR) or infrared, to higher energies, ultraviolet or visible, via multiple absorptions or energy transfers (ETs). In contrast, DC process is the conversion of higher-energy photons into lower-energy photons . For the time being, DC of NIR luminescence (i.e., NIR quantum cutting (QC)), which down-converts one incident UV-blue photon into two NIR photons (approximately 1,000 nm), has attracted more attention for their application in silicon solar cells by modifying the incident light wavelength . As it is well known to us that the solar spectrum and the bandgap energy of silicon semiconductor do not match each other, thus photons with energy lower than the bandgap could not be absorbed, while for photons with energy larger than the bandgap, the excess energy is lost by thermalization of hot charge carriers . Take these sources of energy loss into account for the solar spectrum; the maximum energy efficiency is 30% only for a crystalline Si solar cell with a bandgap of 1.12 eV . Considering this, if the conversion of one UV or visible photon into two NIR photons with energies about 1.12 eV is realized through QC in a silicon solar cell, the energy loss related to thermalization of hot charge carriers can be reduced, and the solar cell efficiency will be enhanced greatly to satisfy the application requirement . To obtain high NIR QC efficiency, other Ln3+ ions are generally codoped with Yb3+ in the hosts, and it is commonly demonstrated in Ln3+-Yb3+ (Ln = Tb, Tm, Pr, Er, Nd, and Ho) couple-codoped materials . Generally speaking, there are two mechanisms involved in the NIR QC in Ln3+-Yb3+ couple : one is second-order cooperation of energy transfer (CET) based on one donor and two acceptor ions, and the other is first-order resonance energy transfer (ET). Nevertheless, CET process is not as efficient as resonance ET [7–9], but high CET efficiency would be realized at high Yb3+ concentration. Thus, a NIR QC via resonant first-order ET process seems more favorable for luminescent materials, which requires an intermediate energy level of donor ion to resonantly excite acceptor ions by a two-step ET process. There are many reports about second-order CET [2, 10–14]; however, there are few reports about first- and second-order ETs occurring simultaneously in one research system. On the other hand, to fulfill the requirements of NIR QC, host materials should have the energy of phonons as low as possible in order to reduce probabilities of multiphonon relaxations between spaced energy levels of Ln3+ ions. Cubic BaGdF5, a tri-fluoride compound, has a wide bandgap and low phonon energy which is a suitable NIR QC matrix . Meanwhile, Ho3+ ion has favorable metastable energy levels and considerable energy match between Yb3+ and Ho3+, so Ho3+/Yb3+ couple could be a good choice in NIR QC investigation. However, NIR QC reports in Ho3+/Yb3+-codoped materials are limited in NaYF4 and glass ceramic [7, 9]. In addition, considering NIR nanomaterials is convenient in the practical application of the coating for the solar cells. Herein, we prepared BaGdF5: Ho3+, Yb3+ nanoparticles with different Yb3+ concentrations by a trisodium citrate (Cit3−)-assisted hydrothermal method, which is less finicky, low-cost, and effective for large-scale production. Furthermore, NIR QC via first- and second-order resonant ET processes and a back ET from Yb3+ to Ho3+ in BaGdF5: Ho3+, Yb3+ nanoparticles is firstly investigated, and the corresponding quantum efficiencies (QE) are also calculated. BaGd1 − 0.01 − x%Ybx%Ho0.01 F5 (0 ≤ x ≤ 20) samples were prepared by a hydrothermal process. Firstly, 1 mmol rare earth oxides Gd2O3, Yb2O3, and Ho2O3 were dissolved in dilute HNO3 solution, and the residual HNO3 was removed by heating and evaporation, resulting in the formation of clear solution of RE(NO3)3 (RE = Gd, Yb, Ho). Cit3− aqueous solution was added into the Ba(NO3)2·2H2O and RE(NO3)3 solution to form metal-Cit complex. After vigorous stirring for 30 min, aqueous solution containing 4 mmol NaBF4 was poured into the above solution, and pH value of the mixture was adjusted to about 4.5 by adding diluted HCl or NH3·H2O. After additional agitation for 15 min, the as-obtained mixed solution was transferred into a 50-ml teflon autoclave, which was tightly sealed and maintained at 180°C for 24 h. As the autoclave was cooled to room temperature naturally, the resulting precipitates were separated via centrifugation, dried in oven at 80°C for 12 h.
The XRD patterns were obtained on Rigaku D/max-2400 powder diffractometer (Rigaku Corporation, Tokyo, Japan) using Cu Kα radiation (1.5405 Å) at 40 kV and 60 mA. The size, shape, and structure of the as-prepared samples were characterized by SEM (S-4800). Emission and excitation measurements were performed using an Edinburgh Instruments' FLS920 fluorescence spectrometer (Livingston, UK), and a 0.3-m double excitation monochromator and two emission monochromators to record the emission spectra in the wavelength range of 200–850 nm (with a Hamamatsu R928 photomultiplier tube, Bridgewater, NJ, USA) or in the wavelength range of 850–1650 nm (with a liquid nitrogen-cooled Hamamatsu R5509-72 PMT). All spectra were measured at room temperature. The XRD patterns and representative SEM photograph of BaGd1 − 0.01 − x%Ybx%Ho0.01 F5 (0 ≤ x ≤ 20) nanoparticles are shown in Figure 1a, b, respectively. It is obvious that the locations and relative intensities of the diffraction peaks coincide well with the data reported in the JCPDS standard card (no. 24–0098). No additional peaks of other phases were found, indicating that the pure-phase BaGdF5 is obtained. It can be seen from Figure 1b that the nanoparticles are relatively dispersed with uniform granular morphology and sizes which are about 40 nm. XRD patterns and SEM image. (a) The measured XRD patterns of BaGdF5: 1%Ho3+, x%Yb3+ (0 ≤ x ≤ 20) as well as the standard XRD pattern of BaGdF5 (JCPDS no. 24–0098) used as a reference. (b) SEM image of BaGdF5: 1%Ho3+ nanoparticle as a representative. PLE and PL spectra by monitoring Ho 3+ emission. 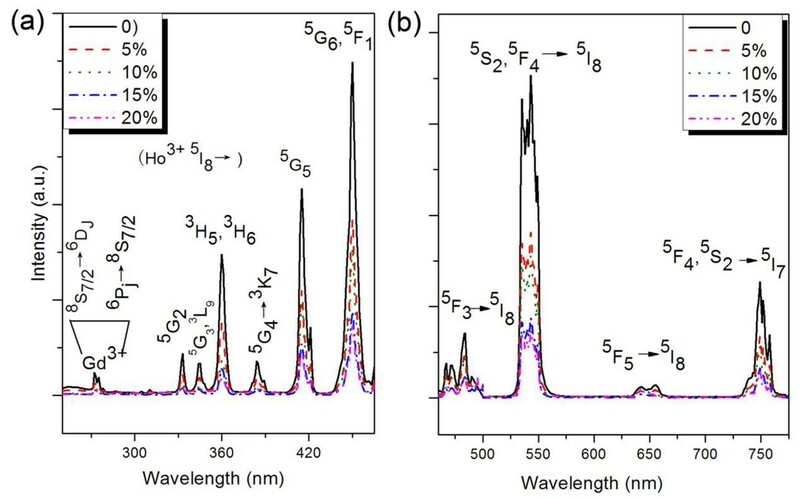 (a) PLE spectra by monitoring Ho3+: 5S2 → 5I8 emission at 540 nm and (b) visible PL spectra under excitation of 450 nm (5I8 → 5 G6, 5 F1) of BaGdF5: 1% Ho3+, x% Yb3+ (0 ≤ x ≤ 20) nanoparticles. PLE spectra of BaGdF5: 1% Ho3+, x% Yb3+ (0 ≤ x ≤ 20) nanoparticles are also recorded by monitoring the characteristic emission of Yb3+ at 980 nm (Figure 3a). The presence of Ho3+ excitation in the PLE spectra of BaGdF5: 1% Ho3+, x% Yb3+ by monitoring the characteristic emission of Yb3+ gives an evidence to the energy transfer from Ho3+ to Yb3+. 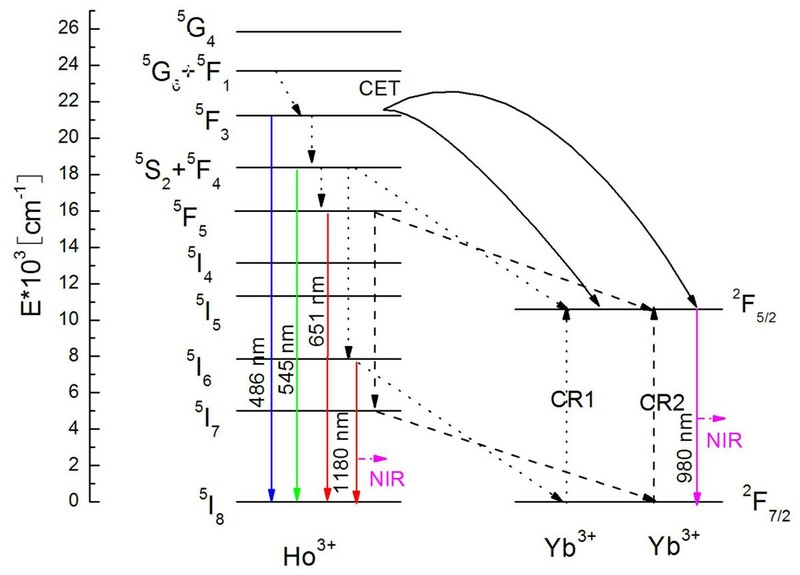 Furthermore, it is noteworthy that a broad emission band in the range of 950–1,100 nm, corresponding to the 2 F5/2 → 2 F7/2 transition of Yb3+ and 5S2,5F4 → 5I6 transition of Ho3+ ions, has also been observed under the Ho3+ excitation at 450 nm (as shown in Figure 3b). This is another evidence of ET from Ho3+ to Yb3+. Simultaneously, the 1,180-nm emission due to 5I6 → 5I8 transition of Ho3+ is also detected. NIR emission intensity of Yb3+ intensifies rapidly with increasing Yb3+ concentration from 0 to 15 mol%. Whereas, 1,180-nm emission intensity of Ho3+ enhances with increasing Yb3+ concentration even when Yb3+ concentration is 20 mol%. That is to say, the NIR emission quenching concentration of Ho3+ is higher than that of Yb3+. The reasons for the above phenomenon will be discussed later. PLE and PL spectra monitoring of the Yb 3+ emission. 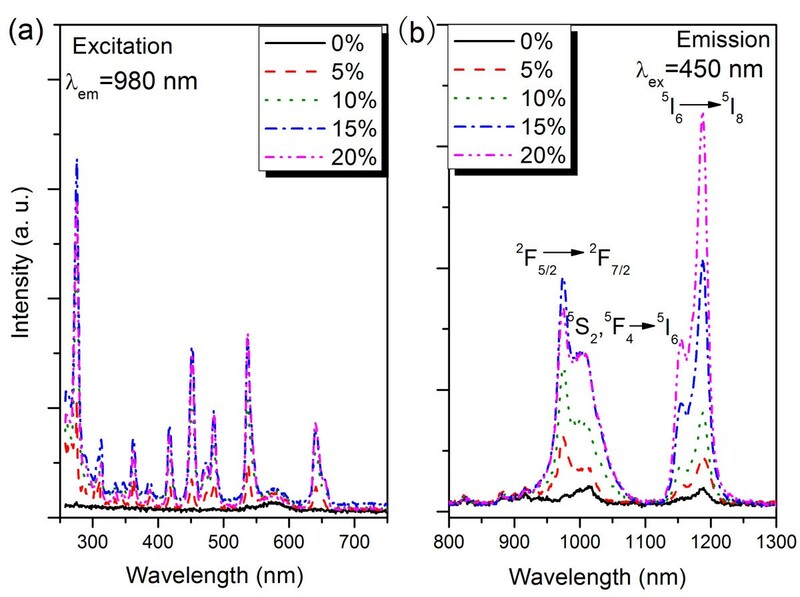 (a) PLE spectra monitoring of the Yb3+: 2 F5/2 → 2 F7/2 emission and (b) PL spectra in the infrared region under excitation of 450 nm (5I8 → 5 G6, 5 F1) of BaGdF5: 1% Ho3+, x% Yb3+ (0 ≤ x ≤ 20) nanoparticles. 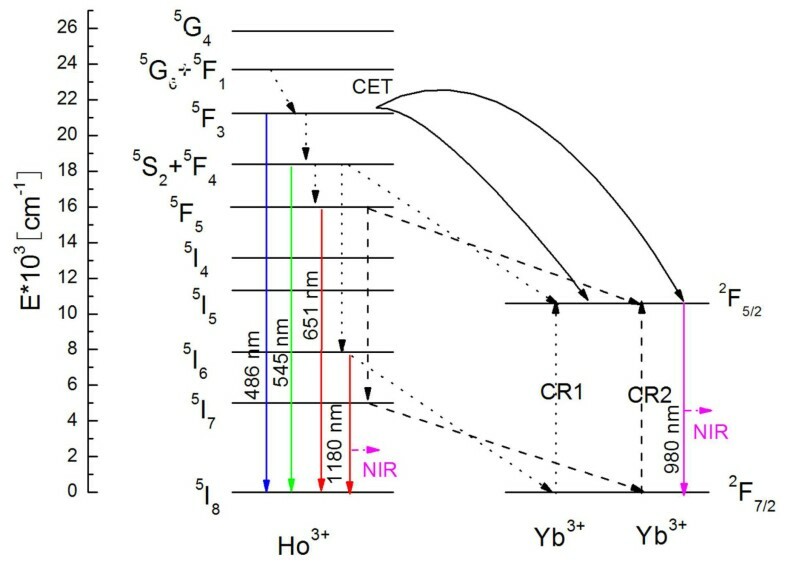 For excitation at 450 nm, there are three possible ET processes from Ho3+ to Yb3+ responsible for the NIR emission of Yb3+ ions, in view of energy levels of Ho3+ xand Yb3+ ions (shown in Figure 4) [18, 19]. (1) Ho3+: 5 F3 → 5I8 transition is located at approximately twice the energy of the Yb3+: 2 F5/2 → 2 F7/2 transition, which in theory can transfer its energy to Yb3+ ions through a CET mechanism: Ho3+(5 F3) → 2Yb3+(2 F5/2) + hν; (2) Ho3+ ion could relax from its 5S2, 5 F4 to 5I6 level and then transfer its energy to only one Yb3+ ion, which belongs to first-order resonance CR1 process (5S2, 5 F4(Ho) + 2 F7/2(Yb) → 5I6(Ho) + 2 F7/2(Yb) + hν; and (3) similarly, CR2 process: 5 F5(Ho) + 2 F7/2(Yb) → 5I7(Ho) + 2 F7/2 (Yb) + hν. Energy level diagram of Ho 3+ and Yb 3+ showing possible mechanisms for a NIR QC processes. Decay curves of Ho 3+ . For (a) 5 F3 → 5I8, (b) 5 F4, 5S2 → 5I8, and (c) 5 F5 → 5I8 emissions under excitation of 450 nm. The inset shows the average decay lifetime and energy transfer efficiency as a function of Yb3+ doping concentration. (d) Energy level diagram of Ho3+ and Yb3+ showing mechanisms for NIR QC processes. Also, the corresponding lifetime values as well as ηCET are calculated, which are summarized in the inset of Figure 5a. Unexpectedly, ηCET is calculated to be as high as 92% in the BaGdF5: 1% Ho3+, 15% Yb3+. In this case, the number of the remaining photons relaxed to the lower energy levels than 5 F3 to give other emission is very small. Besides, double-exponential decay curves of Ho3+: 5 F4, 5S2 → 5I8 emission at 545 nm as well as 5 F5 → 5I8 emission at 651 nm with logarithmic coordinates are plotted with various Yb3+ concentrations in Figure 5b, c, and the highest resonant ET efficiencies for CR1(ηCR1) and CR2(ηCR2) are calculated to be 71% and 69%, respectively, which are also efficient. All the above results just indicate that the Yb3+: 2 F5/2 → 2 F7/2 emission should demonstrate stronger intensity and higher quenching concentration than those of Ho3+: 5I6 → 5I8 emission. However, the NIR emission spectra in Figure 3 show distinct results. Based on these experimental results and combining the energy levels of Yb3+ and Ho3+, we brought up a novelty back ET process from Yb3+ to Ho3+ (Yb3+(2 F5/2) + Ho3+(5I8) → Yb3+(2 F7/2) + Ho3+(5I6) + hν) which may be occurring in the NIR QC system, as shown in the Figure 5d, since the back ET phenomenon widely exists in UC for Yb3+, Ho3+-doped materials [20, 21]. This ET not only increases the Ho3+: 5 F5 → 5I8 emission intensity but also reduces the Yb3+: 2 F5/2 → 2 F7/2 emission intensity, resulting in the spectral features in Figure 3.
where the last two terms stand for the extra QEs for CTE and CR1 processes, respectively. The total ηQE for BaGdF5: 15% Yb3+, 1% Ho3+ is calculated to 192% by this formulation. This so high QE partly results from the Ho3+5I65I8 emission (1,180 nm), which is useless to enhance the efficiency of Si solar cells, since this emission does not match the spectral response of Si solar cells. Unlike the common situation that two emitting photons are from the acceptor Yb3+ ions, both the donor (Ho3+) and the acceptor (Yb3+) could emit NIR photons under blue light excitation. The visible emissions decrease with the introduction of the Yb3+ ions, while the NIR emissions at 980 nm and 1,180 nm are greatly enhanced. The quenching concentration of Ho3+ is higher than that of Yb3+. The fluorescence decay lifetimes of 5 F3 → 5I8, 5 F4, 5S2 → 5I8, and 5 F5 → 5I8 emissions of Ho3+ donors were recorded and calculated as a function of Yb3+ concentration. It could be concluded that NIR emissions are mainly through second- and first-order ET processes: Ho3+(5 F3) → 2Yb3+(2 F5/2) + hν, Ho3+(5S2) + Yb3+(2 F7/2) → Ho3+(5I6) + Yb3+(2 F5/2) + hν by spectra and decay curve analysis. The corresponding QE are calculated to be 192% in BaGdF5: 1% Ho3+, 15% Yb3+, so BaGdF5: Ho3+, Yb3+ nanoparticles could open up an approach in designing ultra-efficient photonic devices, for the application in low bandgap solar cells and thermo-photovoltaic energy conversion, etc. LG, JZ, YzW, and PD are all Ph.D. candidates, and YhW is a Distinguished Young Scholar at the Department of Materials Science, School of Physical Science and Technology, Lanzhou University. This work is supported by the National Science Foundation for Distinguished Young Scholars (no. 50925206). We express thanks to professor Xueyuan Chen and doctor Haomiao Zhu of the Fujian Institute of Research on the Structure of Matter for their assistance in measuring the luminescence spectra. LG participated in the design of the study, carried out the total experiments, and performed the result analysis, as well as drafted the manuscript. YhW participated in the design of the study, gave the theoretical and experimental guidance, and made the corrections of manuscript. JZ mainly helped in the experiments and measurements. YzW and PD gave the theoretical and experimental guidance and helped amend the manuscript. All authors read and approved the final manuscript.